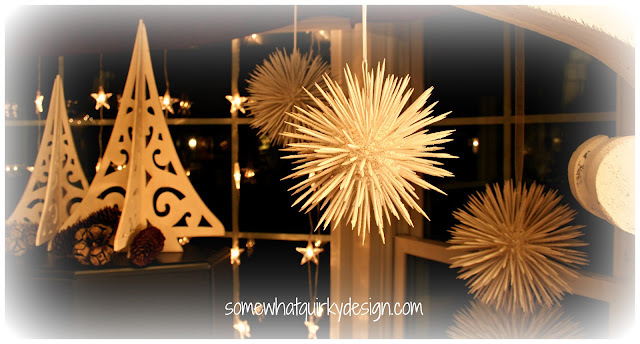 I saw these fun DIY Christmas decorations in a Better Homes & Gardens magazine somewhere around 2001. I was charmed by the way they looked in bunches. So I made 14 of them. They are so fun . . . very easy to make . . . okay for older kids crafting. I'm not sure how they made the ones in their photograph. I just did what I imagined they did. I went out and bought three sizes of styrofoam balls and practically every toothpick in Kansas City. Then sat for several nights of TV watching and stuck toothpicks in the balls. Some of them have as many toothpicks as I could get in the styrofoam. Some of them are a little empty and have different lengths of toothpicks. Get a bunch of toothpicks - the thick ones - either round or the square ones NOT FLAT puny toothpicks! Get tons and tons of toothpicks. Get a some styrofoam balls. I used 2.5", 3", and 4" balls. Stick the toothpicks into the balls however you like. Stick them in far enough so they stay in well. My experience is that the square ones stay in the best but the round ones look prettier. Completely cover the whole snowball with white FLAT spray paint. Spray with a good coat or two of Spray Snow Flocking. This is hard to find. It must be the worst of the aerosols for huffing, because I only find it in stores occasionally. You can find it on Amazon here and here (affiliate links). That's it. Easy peasy and pretty cheap - although you have to buy more toothpicks than you can even imagine. I think I bought out the entire supply of at least two stores, maybe three. To hang them I inserted a hook made from white fabric covered floral wire. Just bend it into a big U and stick both ends deep into the styrofoam. Use whatever ribbon or mono-filament that you choose. They make really great vignettes. I don't use them every year. Mine have lasted a long time. I pack them very carefully wrapped individually in tissue paper. The toothpicks do fall out occasionally - but go back in easily. 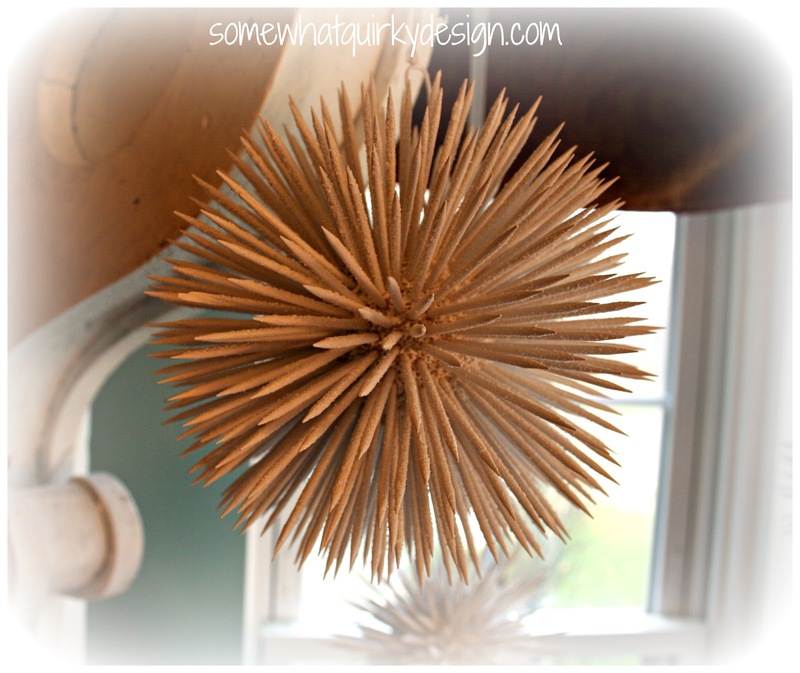 Can you think of any place you might use some spray painted, flocked, toothpicks stuck into styrofoam balls? 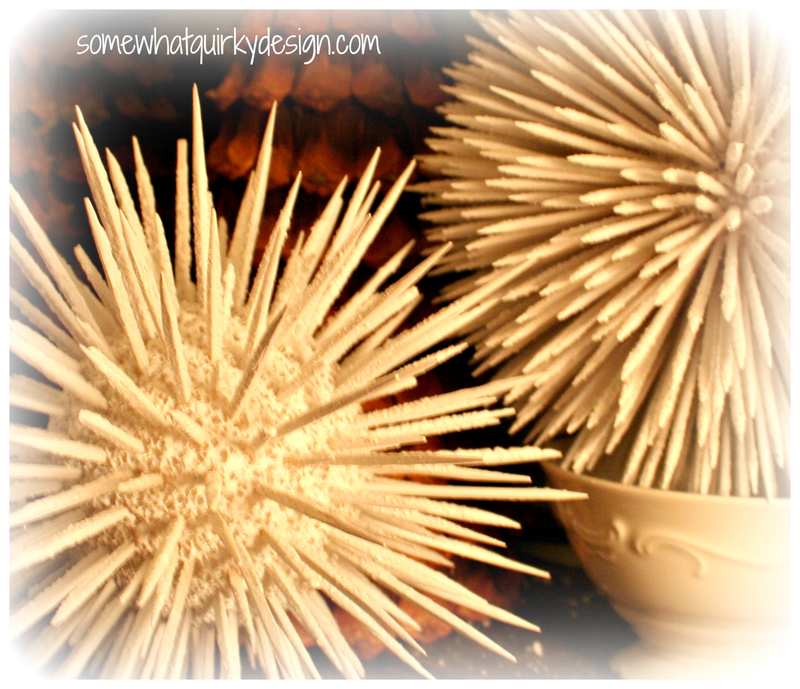 I think these little snowballs give toothpicks and styrofoam some dignity! How about you? Attention! If you want to see how I used my Christmas snowballs this year - 2015 - click here! You're gonna love it! You made 14 of those????!!!!! Awesome girl! I love em!! I am so pinning this! Just like your pine-cones, I love these but I have decided you have the patience of a saint! I love these and I never would have guessed how they were made. I especially love them in your window. I have had trouble finding the flocking stuff as well. they're dreamy! 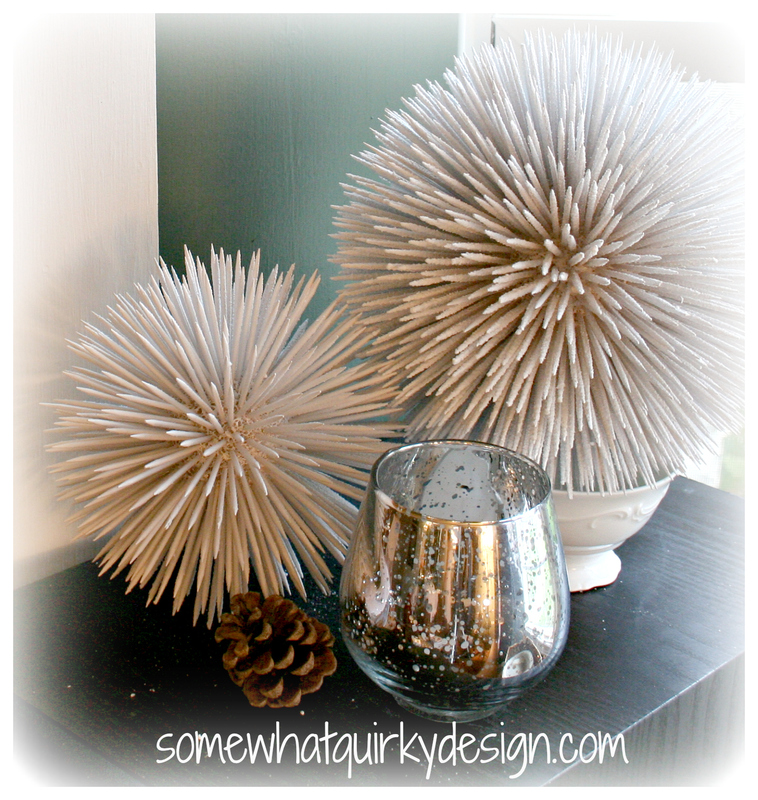 have you made the tissue paper pom poms (circa 2009, martha stewart) too? 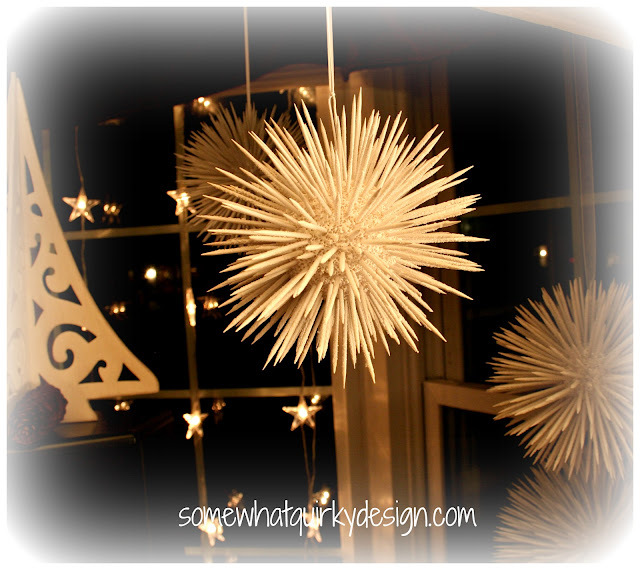 i decided to whip some up for christmas decor. These are so cool! Great job :) I was thinking of trying something like this for my tree topper this year (gobbed in glitter of course). Thanks for the how to! Wow, these decorations are just beautiful! I can imagine them even spray painted in different colors for maybe a spring party or something. Very nice project! Thank you so much for stopping by my blog and leaving a sweet comment, and I am glad you enjoyed my holiday mantel! Those are so cute Karen! Sometimes the easiest things have such an impact! Love them! Ok, now I'm a stalker, I mean follower. I love your blog and your sense of humor! love and how fun...try this for glitter...use a flat paint..brush your pom pom then shake your glitter while paint still wet...spray paint does not work because dries to fast..
Love these! My mom used to make them when I was little and piled them together to form a Christmas tree shape, then hung tiny red glass balls, so pretty! How clever! I love these. It reminds me of the time I strung popcorn and cranberries for a whole week while watching TV. Karen, I remember making these in elementary school at Christmas. Thing is, we just made one. When you make a bunch and group them, they create a chic and eye pleasing look. The simplicity and texture of them is eye-catching! What a great idea and they look very effective...indeed. These are beautiful! So elegant looking; who'd ever suspect they're so simple? This does elevate the humble toothpick and styrofoam ball to a new level. Thanks for sharing! so, so cute..love the idea, great job and thanks for sharing! What an adorable idea! I love how they look hanging there in clusters. Fab! These are so magical looking the way you paired them together!!! I love them! wow! these are so fun!!! i love how they look hanging! WOW they ARE so fun!! Thank you so much for joining in the party Karen! Hopefully your holiday season is treating you well!! these are so adorable. My daughter is out shopping right now so I called her and asked her to pick me up some styrophome balls and toothpicks. She thought I was crazy until she saw my post on Facebook! I cant wait to do this!! This will be an awesome gift for some co-workers and as toppers for gifts!! Hurry home Andrea so I can get started!! Growing up we always had a Toothpick Christmas Tree. It was 6' in diameter and at least that tall. There was chicken wire in the center for the tree form. She and my sisters made toothpick balls for ages! 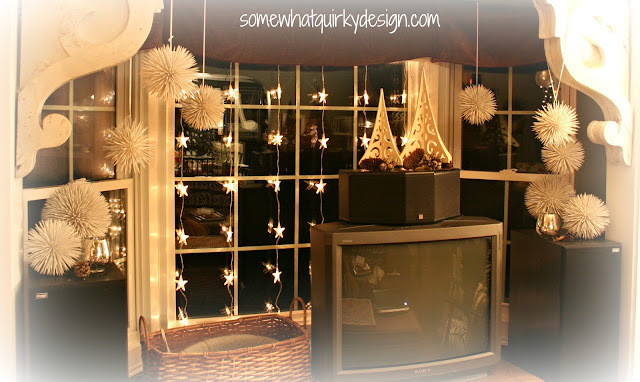 She strung lights on and then sprayed with fake snow and decorated with small blue ornaments. She was written up in the Indianapolis Star in the 60's for her tree.